A 23 year old marketer with a passion for eCommerce. I’m Adam, I’m 23 years old, and I’m based in England. I work with businesses to improve their return from PPC, which primarily involves me strategising and implementing Google AdWords campaigns for online stores. I focus on quality, scaling out highly-targeted Ads that “tick boxes” in the minds of searchers. In my spare time, I love experimenting with new ideas, so I’m currently working on a few projects to see what I can create. I’ll also soon be publishing an eBook; Launching Your First eCommerce Store. If you’d like me to work with you, I’m always interested to hear from clients looking to have me involved on a consultancy basis. You can get in touch with me here. I’m Google AdWords Certified, in Search, Shopping, Mobile and Digital Sales. Although certifications are great, results are more important! Over the last 3 months my PPC campaign conversions have gone through the roof. I’m spending less money and getting more sales. Its allowed me to transform my website into my main selling marketplace. Previously other market places such as Amazon and eBay accounted for about 80 percent of my overall sales. These days the website accounts for that 80 percent. The business turnover has tripled as a result. I’m now at a stage I’m considering giving up my 9-5 job and just doing this full time. I can’t recommend Adam and his services enough. 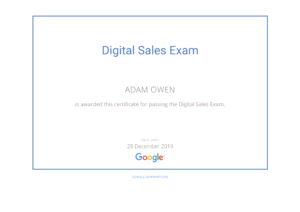 I never failed to be impressed with his in depth knowledge of AdWords and willingness to stay up to date with all the latest solutions, especially in relation to the eCommerce side of the business. We regularly worked on innovative approaches to accounts in somewhat difficult areas. I was also very impressed with his enthusiasm for delivering results and stay one step ahead of his competitors in the PPC eCommerce industry. This year we supported V Festival for the first time and Adam joined our staff team at V in a completely different role to that which he’s used to at Leeds Festival; Adam managed a team of 20 volunteers working on a busy gate supervising the ticket scanning operation. This was a demanding role and Adam excelled in his team supervision and support. Adam is a valued member of the team – we look forward to him returning to join us next season. I have found Adam to be very motivated and highly innovative, with an excellent attitude towards learning. I have been impressed with his strong work ethic, which has developed over time. He has some fantastic ideas and is very talented. He has been an absolute pleasure to work with and I predict a bright future.